Home > Celebrity Style > YouTuber Gigi Gorgeous and Nats Getty Are Engaged! YouTuber Gigi Gorgeous and Nats Getty Are Engaged! The heiress planned an elaborate proposal in Paris. 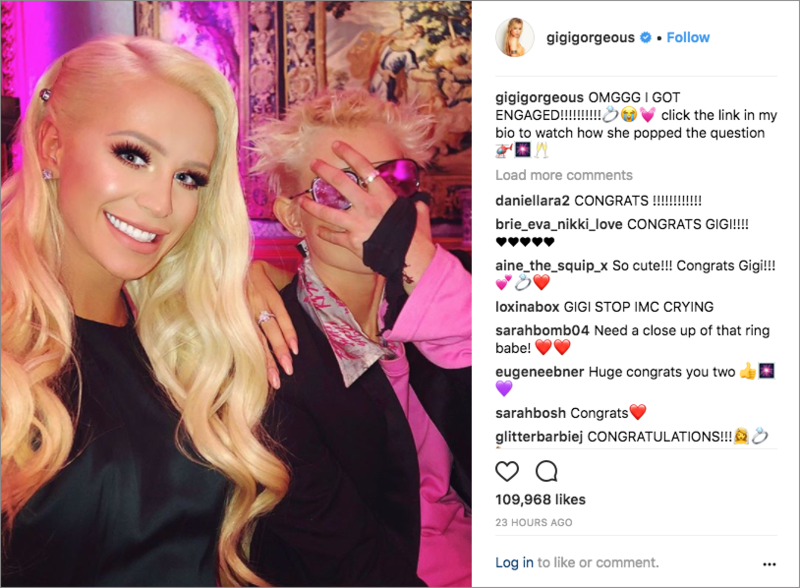 YouTube star and TV personality Gigi Gorgeous, whose legal name is Giselle Loren Lazzarto, has recently announced that she is engaged! Natalia Williams, also known as Nats Getty, proposed in Paris after about two years of dating. Given the extravagant proposal (watch the whole video below! ), we can’t wait to see what the wedding will be like. Luckily, there is sure to be a video of the occasion. If you’re not already familiar with the duo, you may be wondering if Nats is part of those Gettys. She is indeed the great-granddaughter of J. Paul Getty. The Gettys have been top of mind recently, thanks to the film All the Money in the World and the upcoming FX miniseries Trust – both about J. Paul Getty’s refusal to give in to extortion when his grandson was kidnapped by a mafia crime group. Though the Gettys first made their money from oil, Nats’ uncle founded the famous Getty Images, and her brother is fashion designer August Getty. In fact, Gigi has even modeled for August Getty. Gigi may primarily be known for her makeup tutorials and other online videos, but she has also appeared in Adam Lambert’s music video for “Another Lonely Night.” The transgender activist is also the subject of the documentary This Is Everything: Gigi Gorgeous about her transition. The film premiered at Sundance and can currently be viewed through YouTube Red. See bridal gowns inspired by the dress Lydia Hearst (daughter of Patty Hearst) wore to her wedding to Chris Hardwick and learn more about country star Brett Young's proposal.